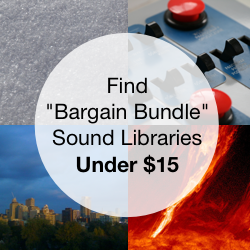 You are here: Home / News / Website Feature / All Featured Sound Libraries 50% Off – 1 Week Only! 239 sounds, 4.49 gigabytes, $74.00 on sale for $37.00. View the Battlefield Howitzers page. 72 sounds, 4.47 gigabytes, $49.00 on sale for $24.50. 41 sounds, 607 megabytes, $39.00 on sale for $19.50. See more detail about the fighter jets. 203 sound clips, 4.96 gigabytes, $57.00 on sale for $28.50. Visit the Race Car Maneuvers page. 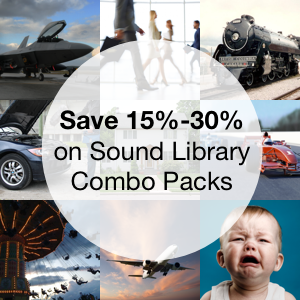 39 sound clips, 281 megabytes, $29.00, on sale for $14.50. 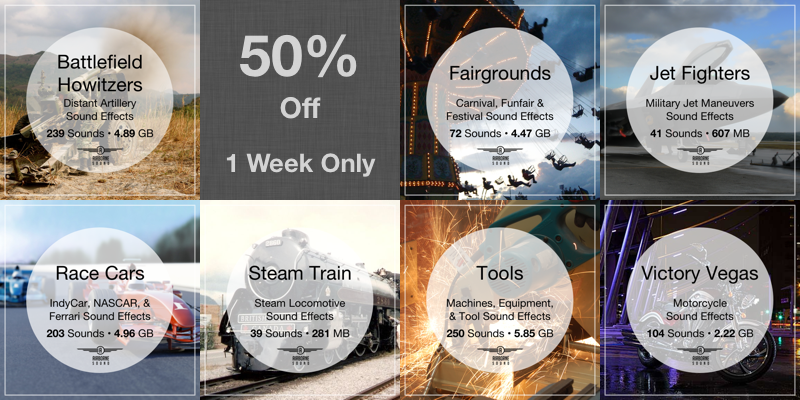 Learn more about the Steam Train sound bundle. 250 sound clips, 5.85 gigabytes, $46.00 on sale for $23.00. Browse detail about the Tools sound fx collection. 104 sound files, 2.22 gigabytes, $37.00 on sale for $18.50. Learn more about the Victory Vegas Motorcycle sound clip collection. Use promo code FEATUREDOCTOBER at check to apply the discount (instructions). Contact Airborne Sound if you have any questions about applying the discount. 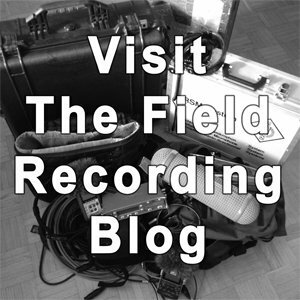 All sound clips include 96 kHz/24-bit stereo WAV files with 13+ fields of Soundminer metadata. Note: Battlefield Howitzers include some 5.1 sounds. Tools has some quad recordings, and the Victory Vegas as some 3-channel recordings. The Steam Train collection is provided at 48 kHz/24-bit resolution. If you have any questions about this sale or any of our sound effects, please contact me.